Synopsis of "The Curse of Inca Gold"
The high-stakes battle to control the world's richest gold mine. When you want to run a dictatorship in what is, supposedly, a democracy, it helps to keep a single overriding principle in mind: Bribe everyone. 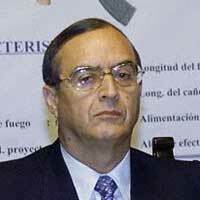 Vladimiro Montesinos was the de facto chief of Peru's secret police and the "man behind the curtain" throughout former President Alberto Fujimori's 10 years in office, from 1990 to 2000. As Fujimori's eminence gris, Montesinos enjoyed almost unlimited power and oversaw a network of cronies in political parties, the army and the government, as well as in the media and the business world. Montesinos understood that a system of checks and balances works only when politicians, judges and journalists are doing what they are supposed to do -- that is, checking and balancing. In Peru in the 1990s Montesinos acted with few restraints. "Montesinos and Fujimori maintained the façade of democracy, but drained its substance," says John McMillan, a Stanford University economics professor who is writing a book on Montesinos. At first, the Fujimori government was very popular in Peru because the new president -- an engineer of Japanese ancestry -- was considered a political independent who pledged to control inflation, attract foreign investment and defeat a self-styled Maoist guerrilla group, the Shining Path, which was terrorizing the country. President Fujimori and his right hand man, Montesinos, succeeded in defeating the Shining Path, though they would later be criticized by human rights groups for relying in part on death squad killings, torture and kidnappings. Early on, Montesinos sought to establish a relationship with the CIA through its Lima office. The CIA was welcoming. By 1992, the CIA's Latin American division was lobbying headquarters in Virginia to fund a counter-narcotics program in Peru run by Montesinos. According to the Center for Public Integrity in Washington, D.C., the CIA gave the narcotics division of Montesinos's National Intelligence Services (SIN) an estimated $10 million in the 1990s. Some of these funds, the Center alleges, ended up in Montesinos's personal coffers. Now that Montesinos has fallen from power and resides in a maximum security prison in Peru, facing more than 70 criminal charges, investigators are probing his secret financial arrangements. Antonio Maldonado, the Peruvian prosecutor in charge of investigating corruption under President Fujimori and Montesinos, told FRONTLINE/World that his team is actively investigating more than $170 million seized from overseas bank accounts, an additional $49 million that has been identified but not yet repatriated, and more than $600 million found in bank accounts in Panama in September 2005. Maldonado said his investigation would involve determining whether the CIA provided any of these funds. At the peak of his power, Montesinos involved himself in all manner of backroom deals and political intrigues. One of the biggest cases involved a battle over who would control the Yanacocha gold mine in Peru, which would become the world's richest gold mine. In 1994, a dispute broke out between the companies that owned the mine: France's BRGM (Bureau de Recherches Géologiques et Minières), Australia's Normandy Mining, Peru's Buenaventura and America's Newmont Mining. The legal battle for control of the mine dragged on through the Peruvian courts for four years. Fearing that the French were applying undue influence on the Peruvian legal system, Newmont dispatched Larry Kurlander, a senior executive and troubleshooter, to Peru. In 1998, Kurlander met with Montesinos to discuss the case at the spymaster's intelligence headquarters. Kurlander also lobbied the U.S. State Department to get involved, and Peter Romero, the official in charge of Latin American affairs, contacted Montesinos by phone. Why would such a high-level U.S. official and one of the top executives at Newmont seek out a nation's intelligence chief? What role could Montesinos play in helping to resolve a legal dispute pending before Peru's Supreme Court? The answer is suggested in a July 1999 U.S. State Department cable which states, "There is no one who stands toe-to-toe with Montesinos in the Peruvian government, and nothing the government does on intelligence, enforcement and security issues occurs without his blessing. Like it or not, he is the go-to guy..."
"Any sort of problem Americans had in Peru, the embassy could call Montesinos and the problem would be solved," says Stanford professor McMillan. "He was a fixer." However, Montesinos's methods of fixing problems had already been strongly questioned by many observers, including the United States government. Well before Newmont's Kurlander and the State Department's Romero contacted Montesinos, others were raising red flags about him as a disreputable and dangerous character. U.S. Senators Patrick Leahy and Christopher Dodd had written letters to the head of the CIA in 1996 questioning the agency's connections to Montesinos. A former U.S. intelligence agent who spoke to FRONTLINE/World on the condition of anonymity, and who interacted with Montesinos on a regular basis, said that during the mid-1990s, the CIA was getting feedback from the State Department that "the U.S. government should not deal with him or meet with him." This intelligence agent still thought that Montesinos was a valuable asset. "Was he a bad guy? Yes," he said, explaining that intelligence comes from "all sorts." Others had less diplomatic descriptions of Montesinos. The spy chief was variously known as "Rasputin, Darth Vader, Torquemada and Cardinal Richelieu," in the words of a 1997 U.S. Army intelligence report released under the Freedom of Information Act. After Newmont's Kurlander, the State Department's Romero, and the CIA station chief in Lima all discussed the Yanacocha case with Montesinos, the spy chief in turn met with Judge Jaime Beltrán Quiroga, who cast the deciding vote in Peru's Supreme Court -- a vote in favor of Newmont, which won control of the gold mine. Despite accusations by the French and others, no proof has ever been established that Newmont bribed Montesinos to secure victory in court. In a written statement to FRONTLINE/World, Newmont said the dispute over the Yanacocha mine "has been the subject of multiple investigations by the Peruvian Attorney General's Office, the Peruvian Congress, and the U.S. Department of Justice. In July 2003, the Peruvian Attorney General's Office announced that its investigation had concluded without finding any evidence of improper conduct in relation to the outcome of the Yanacocha shareholder dispute. In October 2004, Newmont was notified that the Department of Justice had closed its inquiry into the matter. Based on our review of the evidence and discussions with the officers involved in the dispute, we are satisfied that the company complied in all respects with applicable laws, including the U.S. Foreign Corrupt Practices Act. We see nothing to be gained from yet another round of accusation and rebuttal." In 2000, secret tapes made by Montesinos were leaked to the press and began to air on Peruvian television; the ensuing scandal led to the collapse of President Fujimori's government. Fujimori fled the country, faxing his resignation from Japan. Montesinos also fled Peru, prompting a massive international manhunt and a $5 million reward for his capture. Embarrassed by Montesinos's escape, Peru's new, interim government asked the United States for assistance in capturing Montesinos. In February 2001, Peruvian Justice Minister Diego Garcia Sayan told The New York Times, "There are many fugitives in the world today, but not many with connections to a particular agency of the United States government. … You can deduce that there is a special moral obligation in this case to offer Peruvian authorities an extraordinary effort that responds to that responsibility." The FBI took up the search and, in June 2001, pinpointed Montesinos in Venezuela where he was arrested and extradited to Peru. At the end of 2005, the disgraced former spy chief was shuttling between jail and the courtroom, facing a vast array of criminal charges, including influence peddling, abuse of authority, fraud, coercion, corruption, illicit enrichment, money laundering, drug and arms trafficking, extortion, bribery, forced disappearances, torture, murder, harboring a criminal, embezzlement, and illegal wiretapping. The more than 2,700 videotapes Montesinos himself secretly recorded are now key pieces of evidence against him. Regarding his role in the Yanacocha gold mine case, Montesinos's defense is that he was acting at the behest of the United States in the interests of Peru's national security. In testimony before the Peruvian attorney general in 2001, Montesinos said that he had intervened in the Yanacocha case to guarantee U.S. support for Peru in a border clash with Ecuador. (The U.S. is a guarantor of the Rio de Janeiro Protocol, which in 1942 established the borders between Peru and Ecuador.) President Fujimori, Montesinos said, "decided to take steps to see that the judge's decision duly favored this U.S. company," and that is why he met with Judge Beltrán. In later testimony, in April 2002, Montesinos argued he was merely following orders. "The fact remains that Peter Romero [then the Assistant Secretary of State for Western Hemisphere Affairs] called President Fujimori and myself," he said. "Then the president called me in order to give me the task, and I fulfilled it. Now, how the company won, what it did win, what it did not win, those are details that I ignore. I was given a mission, and I fulfilled the mission." Many close observers in Peru say Montesinos never did any political favors for free. A former aide at the National Intelligence Services (SIN) has testified about unsubstantiated rumors that Montesinos received a $4 million payment for his services in the Yanacocha case, a charge that has never been proven. "Maybe Mr. Montesinos didn't need to be influenced," said former French ambassador to Peru Antoine Blanca, who was representing French government interests in the case at the time. "He knew exactly where his interests were … he worked for the CIA." By Ali Berzon, Sarah Gordon, Aaron Selverston and Marlena Telvick.